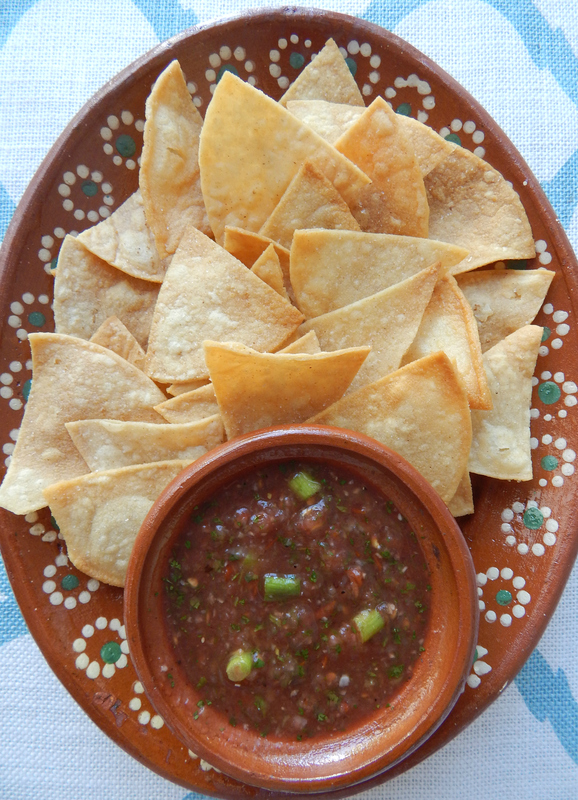 Store-bought chips have nothing on the homemade ones. They just don’t. When I was a little girl and my mom would make chilaquiles for breakfast I would sneak into the kitchen and take a couple of the perfectly fried and crisp tortillas before they got added to the spicy sauce. It’s funny how little memories like that come back to you. I love making salsa. There are so many variations, and it’s so easy. Whenever I am at a party or anywhere where someone has made a delicious salsa I always ask them how they made it. I end up trying my own variation afterward. This salsa is a good one because it is not too hot, and it is very fresh tasting. 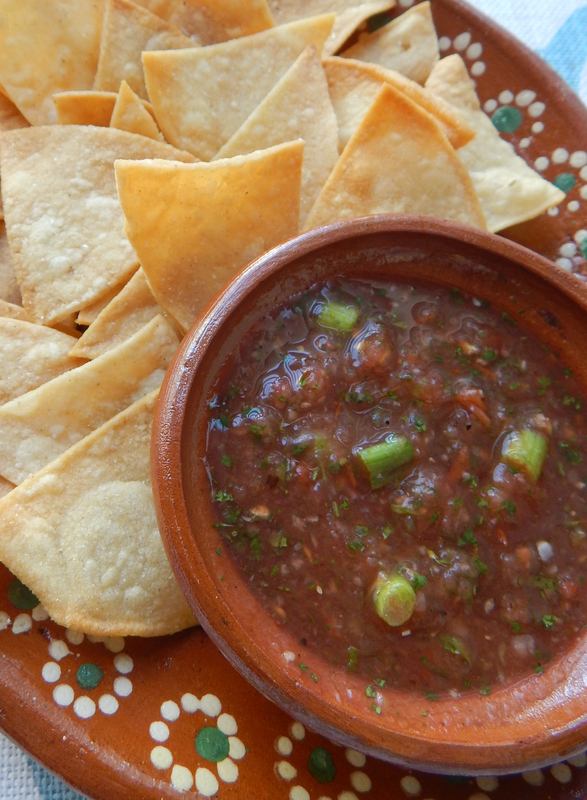 Be careful with the combination of this salsa and chips, because it is very hard to stop eating them! 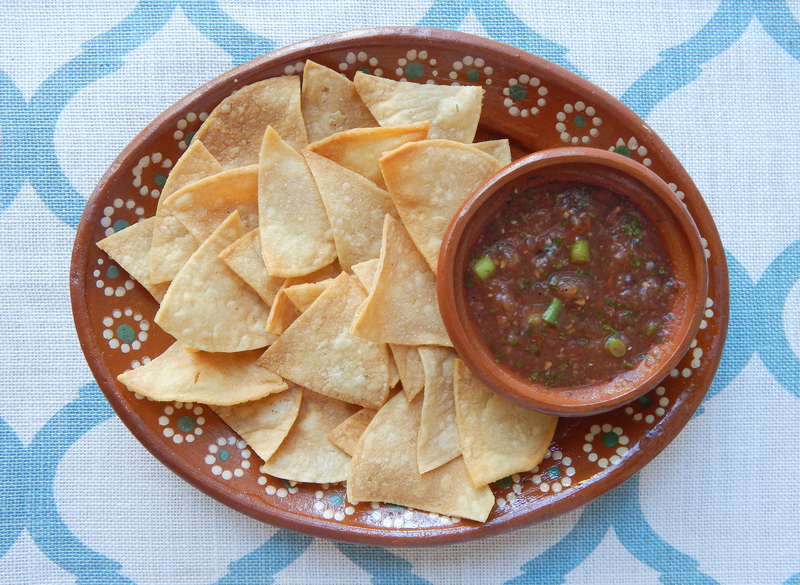 You can put this delicious salsa on any lots of things. Try it over pan fried eggs to make quick huevos rancheros. I made it for breakfast, and posted a photo here on my Instagram. 1. Heat a large nonstick skillet to medium high heat. Add whole tomatoes to the pan and let them cook/char on the outside for about 10 minutes flipping them over frequently. The skin will turn golden to very dark in some areas, and that is what you want to see. 2. Once the tomatoes are charred remove from pan and let them cool for a couple of minutes. Then, using a small knife cut off the small core on the top of the tomato. Add the tomatoes and all other ingredients except the green onions to your blender. Pulse all ingredients until the salsa is mostly smooth, but still has a few small chunks and some texture. 3. Add salsa to a container with a lid where you want to store it. Stir in the green onions and adjust seasoning if desired, but remember the flavor will also develop once the salsa cools. Cover the salsa and cool in refrigerator for at least 2 hours for best results then serve. 4. To make the chips stack the tortillas on top of each other. Cut them in half across to make half circles. Then cut each half stack into thirds to make large triangles. Line a large plate with paper towels to place the chips on once they are fried. 5. Add vegetable oil to a large nonstick or cast iron skillet. The oil should cover the bottom of the skillet and be about ¼ to ½ inch high. It doesn’t have to be exact, and the amount of oil will vary depending on the size of your skillet. 6. Heat up the oil on medium high heat. Again, depending on your skillet the heating time will vary. Once the oil is heated add 1 tortilla triangle to the oil to test the heat. The oil should bubble up around the tortilla and sizzle. If it does this then the oil is hot enough. Add half of the tortillas spreading them evenly into one layer. They fry very quickly, do not leave them unattended. Once they are golden brown on the 1st side flip them to second side using a spatula. Once they are cooked and golden brown on both sides immediately remove from the skillet using spatula and place on the paper towel lined plate. Sprinkle with sea salt right away. Repeat with the next batch of tortillas until finished. 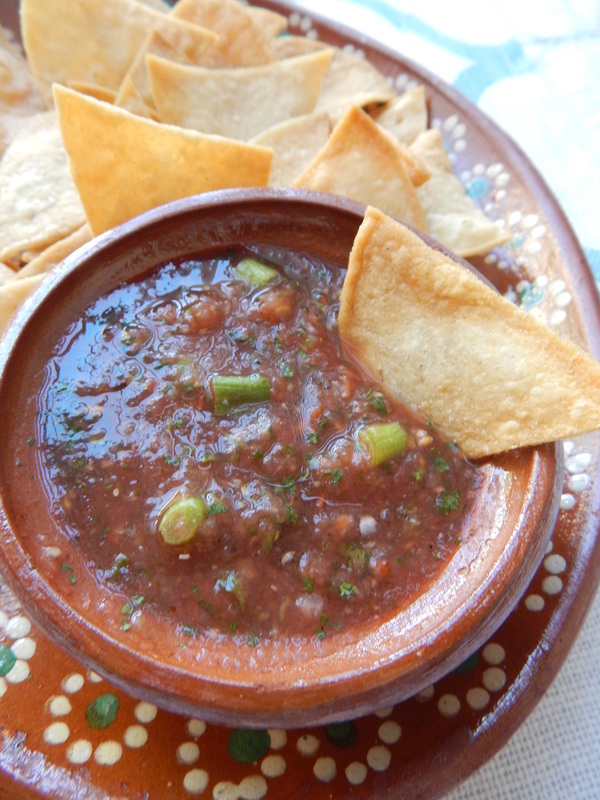 • I prefer to make this salsa the night before I want to use it so that all the flavors have a chance to come together overnight, and I like to make the chips fresh when I want to serve them.